Again, I will keep taking requests and if a pitcher is in the news, I will probably look at them. Some pitchers I am considering are Juan Nicasio, Carlos Rodon and Roenis Elias. Why I watched: Great in the AFL and as a reliever. Horrible as a starter. • The 24-year-old righty threw a straight 89-94 mph fastball with some release side run. It “rose” a bit making it flyball in nature (30% GB%). It was his only called strike pitch (63% Zone%). • His only other pitch I saw was his slider. It runs from 1-7 with some good action. The problem with the pitch is he can’t throw it for strikes. It was used a chase pitch and the Mets didn’t chase it. • He supposedly has a change, but I never saw it. Final thoughts: He is a reliever and with 2-pitch mix (hard fastball and power slider) he could end up closer at some point. Don’t own him if he is a starter, but if he moves to the bullpen look to pick him up. In a small sample in 2014, he had a 25% K% and 0% BB% as a reliever (8.2 IP). Why I watched: He just got traded. • The 24-year-old righty seemed to nibble quite a bit and even give away some pitches. He would get ahead in the count and then immediately even it up. He could be more efficient with his pitches. • His fastball was between 91-95 and generally straight. When he throws it slower, it has a bit of a dip and run. He knows how to move it around the zone and seems to be able to change speeds with it. A few times he dialed it up and got the strike out. • He threw is curve some, but not as much as in the past. It was at 76-78 mph and he occasionally threw it for strikes. He had command of the pitch in this game as it was inconsistent and repeatedly in the dirt. I didn’t notice it from the angle, but he really gets on top it with a high release point. I wonder if players can tell it is coming. In 2012, he got a 11.4% SwStr% with the curve. It dropped to 6.7% in 2013 and 4.7% in 2014. Additionally, the groundball rate has gone from 54% to 44% to 32%. It does not seem to be working for him right now. • His third pitch, a cutter, was a pleasant surprise. It was 86-88 mph with a 12-6 motion and acted like a change. It gives him a decent third pitch to keep batters off guard. Final thoughts: I expected worse. The lack of curve ball use and production from it worries me a bit. It was a good pitch a few years back, but now not so much. The cutter gives him a nice 3rd pitch, but he needs to get back his curve if he wants to be effective. Why I watched: Two readers asked (I will always take requests). • The 26-year-old righty throws possibly six different pitches and no one (Pitchf/x, BIS and Brooks) is close to classifying them the same. I hope I explain them all. 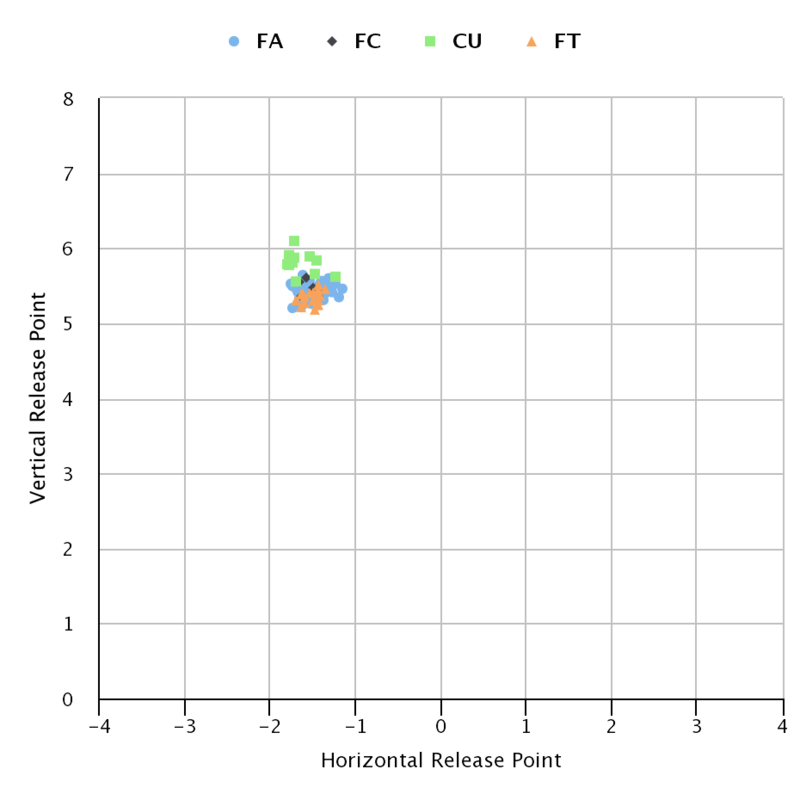 For example, here is how Brooksbaseball.net classified his pitches from the start I watched. I will go through all six pitches I saw and give the name I will use from then on. • Pitch 1 (fastball) He used a 90-94 mph fastball with arm side late tail. This pitch by itself could put him in a bullpen. He will own righties with the pitch. For the season, he got 52% GB% with a 5.5 SwgStr%. 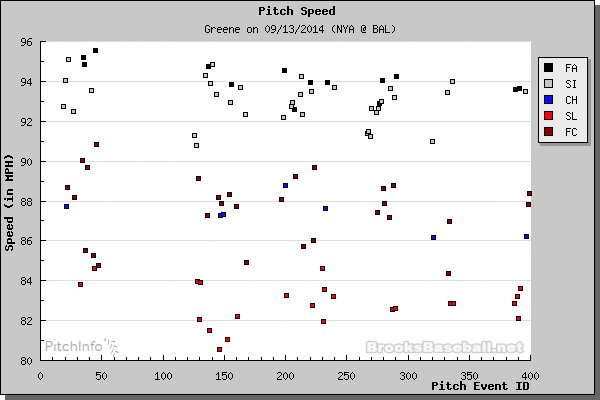 I noticed his velocity dropping a bit during the game and it can be seen in the above graph. It is not a ton of drop, but he did have more in his last start of the season. He could have been fatigued. • Pitch 2 (sinker): Additionally, he threw a fastball at the same speed with didn’t run and sank a bit. A nice change from his normal fastball. • Pitch 3 (cutter): This is the first pitch he threw in the 83-88 mph range. It comes in straight and them drops down with some glove side run. This pitch is also plus and gets a good number of ground balls (48%) and swinging strikes (17%). • Pitch 4 (change): It came in straight and just dropped a bit at the end. While Brooksbaseball.net has him throwing only 64 of them, he had a ground ball rate of 50% and a 25% whiff percentage. • Pitch 5 (slider): It was between 80-83 mph with a huge amount of glove side run (2 to 8). The pitch is a swing-and-miss pitch. I could see how reports had him as a reliever using it and his fastball. • Pitch 6 (curve): This pitch in the same velocity range doesn’t run like the slider, but just drops. • The pitch combination generally works. I think he got too fancy with his off speed pitches and should use his fastball more. It is good enough to get strikes with and then use the change, cutter or slider for a swing-and-miss. • Sometimes he was hurt by horrible Yankees defense. In the future, the porous D could be a real issue with him and his groundball numbers (50%). • He is going to give righties fits as seen by is 31% K% vs RHH. It was a respectable 17% vs LHH, but his 10% BB% vs LHH was a killer. Lefties don’t’ hit him better (lower HR/9 and BABIP) than righties. He has pitches with break in each direction to mitigate lefties, he just needs to use them. Final thoughts: I am going to own way too many shares of him in 2015. I could see his numbers improve as he learns to trust his arsenal of pitches. His projections have him regressing. Don’t believe it. Pay for the 2014 results and don’t be surprised if he improves. We hoped you liked reading Quick Looks at DeSclafani, Miller and Greene by Jeff Zimmerman! Interesting report on Greene. Thanks.